Let's say winter's chill was something you could no longer take as a Great Lakes sailor. Or perhaps you just want to extend your sailing season beyond the boundaries of summer. What options do you have? You could just opt for a bareboat charter somewhere in the Caribbean and consider the itch scratched. But then you'd miss out on all the adventure of moving a boat between the Great Lakes and the Caribbean. And you wouldn't be sailing your boat. I'm here to convince you that the best option is to sail your own boat south. What follows is an overview of the route you could take to get you and your boat to warmer water and weather from the Great Lakes. You're adventurous if you choose this route. From most starting locations in the Great Lakes, you'll also be seeing the most scenery and passing the most water beneath your keel. Some of the most beautiful natural coastline anywhere in the world can be found in the northeast Canadian provinces and along the coast of Maine, which are all potentially part of this route. Additionally, you'll pass through the picturesque Thousand Islands area of Ontario as you exit Lake Ontario and head towards Montreal. Because of the extra mileage required when taking this route, it's generally advisable to get an early start (~July 1 or sooner). Another advantage is being able to leave your mast up for the entire route. The other routes will require you to un-step and step the mast at least once. The St. Lawrence Seaway is actually a series of locks, canals and rivers that connect the Great Lakes to the Atlantic Ocean. Officially, the seaway extends from Montreal to Lake Erie and includes the Welland Canal. The route also includes 15 total locks. There's a minimum vessel size requirement of 20 feet and 1 ton to transit the seaway. More than 2,000 recreational pleasure craft pass through the seaway each season and as such, there area special docks and tie-up areas along the seaway for overnight stays and extended stops. Seaway staff are often available to help with tie-ups and locking through. Be sure to bring good fenders and/or fender boards to protect your boat from the cement lock walls. Be aware that commercial traffic takes priority on the seaway and pleasure craft will often be asked to wait while commercial vessels pass through various locks. You'll also need to be aware of up-bound (from the Atlantic) and down-bound (toward the Atlantic) shipping lanes. Once you reach Montreal, the St. Lawrence River will take you past Quebec and out to the Gulf of St. Lawrence where you can explore Newfoundland, Labrador and New Brunswick if your interest and time allow. The St Lawrence River and Gulf of St. Lawrence are not for the inexperienced, as the extreme tides and currents can make navigation challenging. In fact, the Bay of Fundy inside of Nova Scotia has the highest tidal range in the world with a mean spring range of 47.5 feet. That's right, the water level can rise or fall up to 47.5' in just 12 hours! If leaving the Great Lakes, the current in the St. Lawrence River will be your friend, but coming home on this route can be an upstream battle. Lake Champlain shortcut: Take the Richelieu River from its confluence with the St. Lawrence River at Sorel-Tracy, Quebec (downstream from Montreal) to Lake Champlain and then follow the Hudson River from the southern end of Lake Champlain through Albany to New York City. This bypasses most of the St. Lawrence River and the entire Gulf of St. Lawrence in favor of a quick trip through New York state ending at the feet of Lady Liberty. Congratulations, you made it to the Atlantic Ocean! Now point the bow south and start making some headway towards warmer water. You've still got options. The most popular is to catch the Intracoastal Waterway (ICW) and head south to Florida before making your jump across the Gulf Stream. Or you can pick one of many jump-off spots to begin a blue water passage from the east coast of the U.S. direct to the Virgin Islands. Or perhaps a mid-passage stop-over in Bermuda is more your flavor. In any case, you're now in saltwater and have the world sprawled before your bow. Summary: A great route if you've got time, experience and an adventurous spirit. This is likely the most popular and/or common route from the Great Lakes to the open ocean. Know that you'll need to take the mast down to transit the Erie Canal at a rate of about $4-$8 per foot of mast. There are decent boatyards at both ends experienced in helping cruisers unstep and step their masts. Remember to be prepared with a means of carrying and supporting your mast on deck when it's down. There are also at least a few variations to consider within this route. Your first decision point will have to be made somewhere in Lake Huron (if you're coming from the Upper Great Lakes). You can either make your way to the far southern end of Lake Huron and follow the St. Clair River into Lake St. Clair and on south through the Detroit River into Lake Erie, or take the Trent-Severn Waterway south out of Georgian Bay on Lake Huron through Ontario's "cottage country", including Lake Simcoe, and on through a series of locks to northern Lake Ontario. The latter route bypasses Detroit and all of Lake Erie and affords nice side trips through Lake Huron's North Channel and Parry Sound, both of which are legendary in the sweet water cruising world. If you find yourself in Lake Erie, either by way of the Detroit River or because your homeport is there, you'll need to decide if you want to pick up the Erie Canal in Buffalo at the far eastern end of the lake, or if you prefer to transit the Welland Canal into Lake Ontario and make an eastward run to the Oswergo Canal in Oswego, New York. The Oswego Canal will take you about 24 miles south and meet up with the Erie Canal near Three Rivers and Liverpool. At this point, all variations converge back on the Erie Canal near Liverpool, New York (outside of Syracuse) and are ready to continue the eastward voyage through the rest of the canal all the way to Albany. When you reach Albany, the trip will change and you'll leave the Erie Canal behind and head due south on the Hudson River all the way to New York Harbor. As a nice yin to the wilderness yang of the Gulf of St. Lawrence described in the first route above, the New York skyline and all of Manhattan will be on your port beam as you finally exit the Hudson River. Congratulations, you've made it to saltwater! See the continuing routes to the Caribbean described in the first route. Summary: This is likely the most common route from the Great Lakes to the ocean, so services and guides are plentiful. This third option for exiting the Great Lakes and making your way to saltwater may not sound as enticing, but there are some perks, so read on! You’ll essentially be completing the western portion of the Great Loop as you exit southern Lake Michigan at Chicago via the Chicago River and shortly thereafter the Des Plaines River. This is a downstream run, so while your mast won’t be up, your iron genny will still get some help from Mother Nature. As you meander past Peoria, you’ll see some of the heartland to both starboard and port. The Illinois River will eventually dump you into the Mississippi River just north of St. Louis, Missouri. 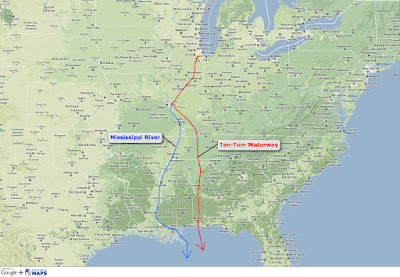 The popular looper route will have you going up the Ohio River near Cairo, Illinois with just a short distance to the Tennessee River and eventually back down the Ten-Tom (Tennessee-Tombigbee) Waterway all the way to freedom from a landlocked existance in Mobile, Alabama. You can also stay the course on the Mississippi River south past Memphis, Tennessee and on through Greenville, Mississippi. You’ll still eventually reach the ocean, but this variation exits the continent near New Orleans, Louisiana. If your homeport is on Lake Michigan or your ultimate destination is somewhere in the Gulf of Mexico or (lucky you!) the Pacific Ocean via the Panama Canal, heading down the Mississippi may make the most sense logistically. Touring through the Chicago metropolis by boat is considered a perk of this route by some. The Ten-Tom Waterway is also a nice aspect of this route, as it’s a treasured inland water resource for southern boaters. Lastly, you’ll have easy access to Florida’s gulf coast and the Keys/Dry Tortugas, which can be a destination unto themselves. This route also allows for a later start, so if you can’t break away in July or even August, coming south through the middle of the country might be a viable option for keeping your winter cruising plans alive. Summary: This route can save time/distance if you're in the western Great Lakes or if you've already cruised the east coast and ICW. Editor's Note: If you've completed any of the above routes, I'd love to hear your opinion and any additional details and tips you may have. While I personally haven't completed these routes, I plan to make an effort someday and have been researching them for a couple of years now. A good overview, but I would contend that the Maritimes have plenty of technical help past Quebec City, but that it's just orientated toward the fishing fleets. Certainly by PEI/Cape Breton Island, there is plenty of places to get things fixed. The north side of the river past Quebec City does get a little wild, however. Can anyone answer at what point on the Mississippi route the mast must come down and where it can go back up? Distance and or time to motor at 5 knots? Thanks for replying and helping out! 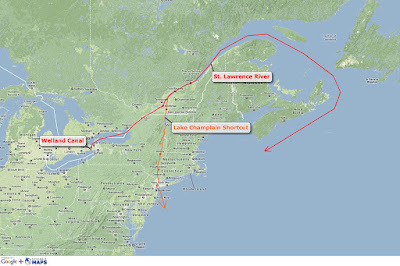 Anyone know the route from Lake Champlain going to Lake Superior in a sailing vessel with mast up or down? You should be able to reverse Route 1 above and use the St. Mary's River out of DeTour Village in northern Lake Huron. It's hard to believe there is no way to connect to the Mississippi from Lake Erie. I figured the Maumee or some river would connect to the Ohio, then across to the Miss? Anybody know a way other than up and over the mitten? No way from Erie to the Miss. The Maumee flows FROM Fort Wayne, IN. It starts as a trickle there. I'm not aware of anything. The Cuyahoga goes nowhere fast. No waterways connect from Eastern Michigan to Western Michigan. Does the Lake Champlain shortcut require unstepping the mast? Not sure, but would like to know. I love this article. Getting a boat is on my bucket list but I want to try to rent one this summer. Any suggestions for boat rentals with guide or something for the inexperienced. Any issues traversing the Trent-Severn waterway on a 42 Catalina with 5 foot draft? Mast up? Is there a requirement to fly U.S. flag through Canada? Standard flag etiquette suggests a vessel should fly the Canadian flag when entering Canadian waters. The host or courtesy flag should be flown alone or separate from U.S. flag if displayed. I believe the minimum bridge clearance on the Trent-Severn is 22', so your mast will have to come down. I've also heard that the waterway authority only maintains navigable depths to 5', so you'd be cutting it close in your 42.
excellent article. thanks so much!